When alive, President Ho Chi Minh taught Signal soldiers "To constantly improve the level of politics and ideology, strive to learn more professional skills and techniques to ensure timely, accurate, confidential, secure, and progressive communication, ... ". Uncle Ho's teachings, as determined by Signal Brigade 26’s Party Committee and commanders, are the Brigade’s motto of action to ensure communication for the task of managing and protecting the airspace of the country. In order to transform Uncle Ho’s teachings into practical actions, Signal Brigade 26’s Party Committee and commanders have focused on leading, directing and intensifying the work of education for all officials and soldiers to instill, make changes in awareness, and increase sense of responsibility in communication assurance for the tasks of the Air Defence and Air Forces, which contributes to firmly protecting the airspace of the Motherland. At the same time, it is also the central content in implementing the Politburo’s Directive No.05-CT/TW on "Promoting the learning and following of Ho Chi Minh’s ideology, dignity, and style”, and the Campaign of "Promoting tradition, dedicating talent to be worthy of Uncle Ho’s Soldiers" launched by the Standing Committee of the Central Military Commission. Thoroughly grasping the meaning and importance of learning and following Uncle Ho, the Brigade’s Party Committee and commanders have developed resolutions on directing, planning, and implementing with synchronous and effective measures in which key and central directing contents have been clearly defined with much attention paid to solving weaknesses and shortcomings to create steady changes in all working aspects of agencies and units. Additionally, the Brigade has always ensured "timely, accurate, confidential, and secure" communication for tasks, especially training and combat readiness. Implementing Uncle Ho's teachings "We must always be prepared at anytime and anywhere...", in the task of combat readiness, the Brigade’s Party Committee and commanders have led and directed the units to strictly maintain commanding duty, unit duty, and combat duty regimes and "Four - Know " in the management of the airspace. Forces and means have been promptly supplemented, and training has been well organized in accordance with combat plans with focus placed on upgrading the level of combat teams and mobile communication group to avoid being passive and unexpected situations. At present, the Brigade is focusing on strengthening the communication system of the Air Defence and Air Forces’ Headquarters and wiring lines and deploying radio transmitters and technical infrastructure at the Headquarters/K12, etc. to ensure safety, quality, and smooth communication. The Brigade has always monitored and managed 100% of the flights, including specialized and mission flights. Especially, communication assurance for exercises and live-firing practices have been always kept smooth and absolute safe. In training, to implement Uncle Ho’s teachings of "Strengthening the military work, of which importance should be attached to the training of soldiers," the Brigade has always thoroughly grasped the superior’s instructions and resolutions, especially Resolution No.765-NQ/QUTW issued by the Central Military Commission on "Improving training quality in the 2013-2020 period and beyond" and Resolution No.227-NQ/ĐU issued on 29-9-2016 by the Air Defence and Air Forces’ Party Committee on "Strengthening the leadership in flight training and safety assurance and preventing flight accidents and flight safety threatening". 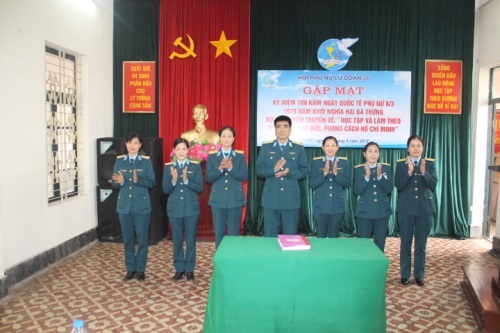 Sticking to the motto of "basic, practical, and solid", the Brigade has actively compiled materials, conducted training and fostering for cadres and trainers, and consolidated and developed new lesson plans, diagrams, models, tools, or drawings, etc. in a synchronous and intensive manner to make it close to combat practice of an Air Defence - Air Force’s signal unit. Besides, much attention has been paid to renovating organization and methods, raising the quality of training with focus placed on two breakthroughs of “Renovating and raising the quality of combat training, and retraining for cadres and officials capable of mastering weapons, ammunition, and new technical equipment”, and ensuring smooth communication under any conditions and circumstances. Training results were 100% satisfactory, including over 86% of excellent and good and several prizes in competitions at all levels. The Brigade was recognized as an Excellent Training Unit from 2012 to 2017, and has been conferred with the “Excellent Training Unit Flag” by the Ministry of National Defence for six consecutive years. For regular construction, the Brigade’s Party Committee and commanders have developed several practical and effective policies and solutions to intensify the inspection and management of the observance of the State law and Army disciplines and correction of task performance of officials at all levels and adjust organizational payroll with more troops assigned to combat duty units. The observance of law and disciplines of officers and soldiers, therefore, has improved without serious violations, while the number of ordinary violations has reduced to 0.02%. For logistics and technical assurance work, the Brigade’s Party Committee and commanders have always paid much attention to promoting the emulation movements such as "Military Logistics follows Uncle Ho's teachings" or "Constructing good troop-feeding and supplies management unit" and strengthening planting and breeding work with practical and effective models. For technical guarantee, the Brigade has regularly ensured synchronized weapons and technical equipment in a timely manner with sufficient quantity and quality for the tasks, especially new and modern equipment. The work of preservation and maintenance of equipment and vehicles to avoid damage, losses, and downgradation. The movements of innovation promotion, technical improvement, scientific research, and practical application have been strengthened. Besides, the role and responsibility of cadres, especially the engineers and technicians, in management, exploitation, and use of technical equipment have been brought into full play. At the same time, the "Quality Day" has been strictly maintained at all levels in association with the Campaign of "Good management and exploitation of weapons and technical equipment towards durability, safety, and saving and Traffic safety" to contribute to well ensuring technical equipment for training and combat readiness. The most obvious change in the Brigade’s "following" of Uncle Ho teachings is that the quality of Party building work has been constantly improved. The Brigade’s Party Committee, committee members, and Party cells have always attached importance to the leadership in improving the quality of cadres and Party members with numerous positive and concrete measures. First of all, the work of management, training, and upgrading of skills, capacity, moral quality, lifestyle, and working method and style in association with self-criticism and criticism have been strengthened to resolutely resist the depressing manifestations of political ideology, morality, lifestyle, "self-evolvement", and "self-transformation" of cadres and party members. In addition, the Brigade’s Party Committee and commanders have focused on improving the leadership capacity and fighting power of party organizations. Other contents have been also well performed such as strict implementation of the principles of democratic centralism and collective leadership in association with individual assignment, construction of internal solidarity and unification, and strengthening of work of inspection, supervision, self-criticism, and criticism among party committees, party organizations, cadres, and party members, etc. It, therefore, has contributed to building party organizations within the Brigade’s Party Committee strong in politics, ideology, organization, and ethics to play the role as a core leading unit to fulfill their assigned tasks. Promoting the achievements, the Party Committee and commanders of Signal Brigade 26 will continue to direct the implementation of Directive No.05 of the Politburo, and focus on building a strong staff and organization, and maintain smooth communication for tasks to contribute to, in association with other forces among the Air Defence and Air Forces, firmly protecting the airspace of the Motherland in all situations.